Biscotti are twice-baked cookies with origins in ancient Rome. In Italy, the cookies are typically dunked in cappuccinos for breakfast. In this light adaption of one of my favorite biscotti recipes, which I’ve been making on a regular basis since college, the dough itself contains ground coffee beans, along with cinnamon, walnuts, and chocolate chips. 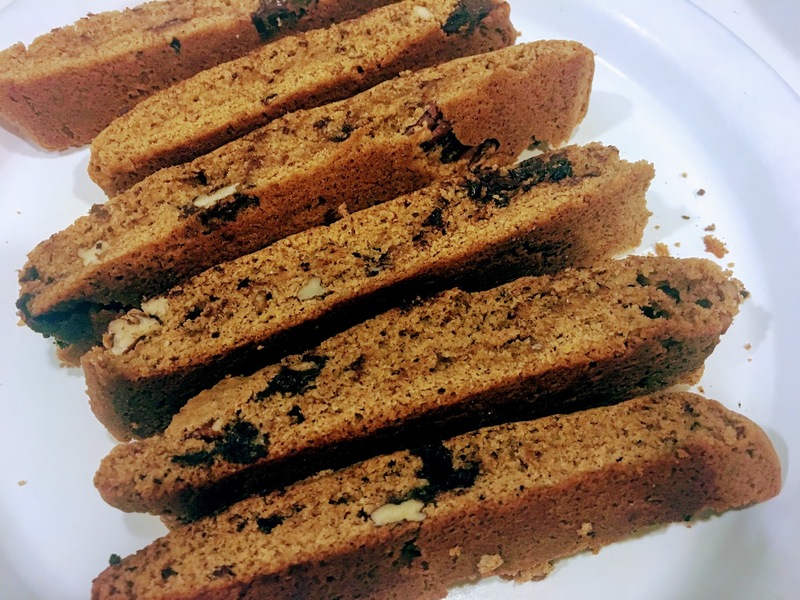 Traditional Italian biscotti don’t contain dairy, but I find that butter, which is commonly added to American biscotti recipes, makes for a softer, richer, more delicious cookie. Butter is an ideal carrier of flavors, so make sure to mix the ground coffee beans directly into the butter. I used a dark roast Brazilian bean for maximum coffee flavor. Preheat oven to 325°F and line a baking tray with parchment paper. In a small bowl, combine flour, salt, cinnamon, and baking soda. Set aside. In a large bowl, cream together butter, sugar, and ground coffee until light and fluffy, about one minute. Stir in eggs until smooth and well-combined. Add flour mixture to butter mixture, and stir until just incorporated. Add chocolate chips and walnuts. Divide dough in half. Form each half into a rectangle (about 10 inches long and 2-3 inches wide) directly on the prepared baking tray. Bake for around 20-25 minutes, until golden brown around the edges and just firm to the touch. Let cool for a few minutes, and then cut into equal-sized slices using a serrated knife. Leave biscotti upright, separating them slightly so there is space between them. Bake for another 15 minutes, until biscotti are crisp and golden brown. Once cool, store at room temperature in an airtight container.